Getting a ticket to return from Kerala on weekends is not a joke - the fact that it was also during Onam celebrations compounded my miseries. Onam was on Monday, and I initially planned to return on Monday night - but there were no tickets. I checked for tickets from Coimbatore, which also seemed sold out. It dawned on me later that I would be travelling with lots of baggage, and there was no way I could do a split journey. I had to travel through in a single bus - then began the hunt for buses from Thrissur. I decided to travel a day earlier (which turned out to be a good decision) - and checked for tickets for Sunday night. Although this meant I had to spend the festive day at work, getting an affordable ticket was more important to me. I quickly checked Kerala RTC, which was sold out. My next stop was Karnataka RTC, which luckily had a couple of seats vacant for the 2133hrs Thrissur-Bangalore Airavat Diamond Class. And one of those empty seats was a window! I grabbed it without much thinking. 2133TRCBNG is one of my favorite services - the buses are generally fast, and usually get to Bengaluru well before their scheduled time. It is never a pleasant experience leaving home - and matters got worse since I was leaving a day before a festival. I had a lot of luggage with me, and I had to hire a vehicle to get to Thrissur - quite unusual for a public transport fanatic in me. The four wheeled "auto rickshaw" took me to Thrissur by 2045hrs - over 45 minutes to go for my bus. The bus station resembled a war zone - buses and passengers jostled for space in the terminal. 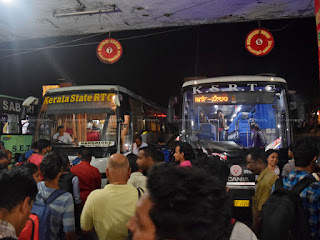 I am never a fan of Thrissur bus station - its too small and crowded for the amount of passengers it handles. 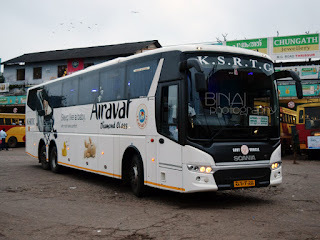 A KSRTC Airavat Diamond Class was already at the bay - I rushed to check, and that was an earlier bus. A special bus to Bangalore was parked a little away. The bus, after dropping me at Bengaluru.. Sometime around 2115hrs, I notice that my bus had already parked at the bus station - but at a far away bay. I headed there - I badly wanted to use the restroom, and I did not want my bags to remain unattended. I got my ticket checked, left my bags in the luggage bay - they were properly tagged and stowed (thumbs up to KSRTC for still doing this). I rushed to the restroom. As I returned, the Kerala RTC bus to Bengaluru had also joined us. The bus station was still crowded - and the crowd increased by the minute. Bangalore riders - as passengers jostle for space.. Although the AC was yet to be turned on, I decided to get in and relax for a while. 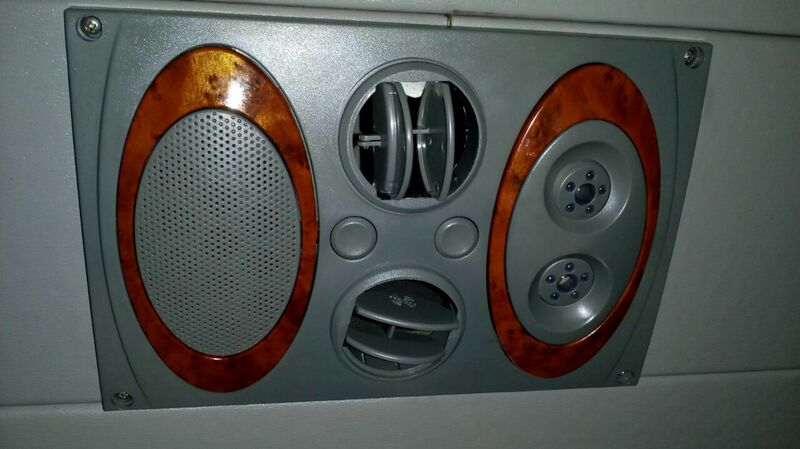 I was super excited to see the modified AC vents - really appreciate this modification. The new ones have good range of movement - but doesn't have a flow controller - so you cannot modify the volume of air that comes out. 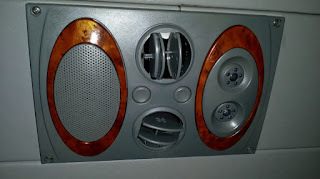 The AC was turned on at around 2130 or so - a few minutes before departure. We got moving at 2135hrs - about two minutes behind schedule. Blankets and water bottles were already at the seat - so the conductor just came around to take a quick headcount and issue tickets to some walk-ins. The driver showed no hurry, and we slowly crawled along the mostly empty roads towards the national highway. Traffic thickened as we entered the highway - overtakes were out of question, and we mostly crawled. There were mini blocks at places. I pushed reclined by seat and tried dozing off. I did doze on-and-off, but did not "sleep". 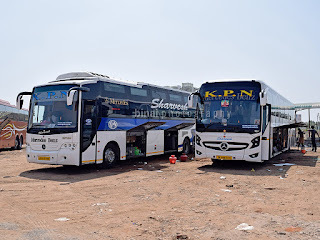 The bus moved quite slow at most places - but we succeeded in reaching Palakkad by 2308hrs - while this bus doesn't stop for a dinner break, it has pick-ups from Palakkad bus station - adding about 15 minutes to the running time. The bus filled at Palakkad - there were a few no-shows. We got moving by 2316hrs. I finally slept a little after we left the bus station (even before we returned to the highway). 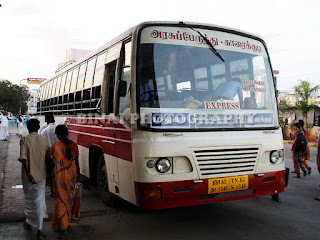 I vaguely remember the bus entering Coimbatore town - but I am not sure if it went to the bus station, or just ran through the city. I slept quite well after that, and woke up around 0430hrs, when the crew turned on the lights to announce a tea break! I still cannot understand why they need a tea break, when they could reach the terminus in 90 minutes from then! 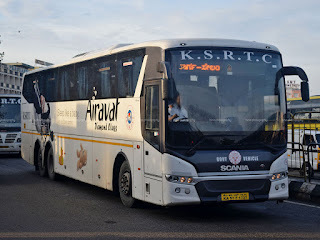 This unnecessary break is quite regular with KSRTC (Karnataka) crew. Hardly anybody got off the bus - and those who got off were mumbling about the unnecessary break as well. We left from there around 0445hrs. I slept for some more time, and woke up just as the crew called out for passengers getting off at Electronic city (0605hrs) - interestingly, the bus took the elevated highway. We reached Silk Board only by 0618hrs - due to a terrible traffic block just before the junction (thanks to water logging). Closing notes: The bus, KA-57-F-1727, homed at Bengaluru Central Division's Depot-4, had clocked a little over 1.17Lakh kms. The bus appeared well maintained. The driving was sleep friendly, and the crew were very polite and passenger friendly as well. The service was, overall, very good. I disliked the tea break at 0430 in the morning - that 15 minute we lost in the break could've let us arrive before the scheduled time - which is a good thing considering the fact that Monday is the beginning of the week, and people need to get to offices on time. The delayed arrival did cause some heartburn to me, and I managed to get to office just in time. Nevertheless, it was a good journey. Pros: Government bus, Originates at Thrissur - so no waiting for it arrive! Will I take this service again? Absolutely! Its my favorite service, but a large margin. Even I traveled that very same day to Bangalore. But I took the ERS-BAND Special train from Ernakulam. By the way, this service that you took seems to be a good option for me too whenever I travel alone. I could take the Kannur Jan Shatabdi from Tiruvalla and board this service from Thrissur. A much better option than the highly irresponsible and customer unfriendly private omni bus operators from my area to Bangalore.